Ever since Sir Charles Napier set sail for the Baltic, with the First Lord of the Admiralty's "full permission to declare war", the more sanguine portion of the British public expect shortly to hear of Kronstadt bombarded, the approaches to St. Petersburg forced, and who knows? perhaps even the Union Jack hoisted on the glittering spire of the Russian Admiralty Palace. There is a very correct idea at the bottom of these anticipations; it is this, that Kronstadt is the decisive point for any naval attack against Russia in the Baltic. Take Kronstadt, and St. Petersburg is at your feet, the Russian Navy exists no longer, and Russia is reduced to what she was before Peter the Great. If England has the forces in the Baltic required for such a feat, and if these forces should fritter away their strength in attacks against minor points, more than might be absolutely necessary, they would commit a blunder of the first magnitude, decisive in its effects perhaps for two or three campaigns to come. But if we know the vital importance of Kronstadt, the Russians know it also, and have acted up to their knowledge. That key of Russia has been surrounded by double and triple armour, bristling with something like a thousand guns. It is well known that Kronstadt takes up the south-eastern angle of a small island[a], about five miles in length, which closes up the narrowing portion of the Gulf of Finland, about 16 miles from the mouth of the Neva. The water on both sides of the island is generally very shallow, having only two channels navigable for sea-going vessels. The one passing to the north of the island has a depth of not less than four fathoms[b] about two or three miles distant from its northern shore, bends round at four miles from its eastern extremity, approaching this latter to within 1,400 yards, but losing about a fathom in its depth of water. Thus the whole of the north-eastern coast of the island is out of cannon range for any men-of-war coming round by this channel, except the western and eastern extremities only. These alone are therefore fortified, the first by the forts Katharine, Alexander and Michael, the second by the walls of the town itself and by two batteries erected on the sands, about 1,000 yards in advance; the larger one of these batteries, however, is reported to be in ruins. Abreast of the north shore of the island, between its eastern and western defences, and fully a mile from the shore, another battery is constructed on the sands, which however is still out of gun-shot range from the four-fathom channel. This northern passage, then, from its general distance from the defences, from the very intricate navigation it offers, and from the considerable shallowing of its south-eastern extremity, may be considered useless for a serious attack upon Kronstadt. Under circumstances where a dispersion of forces is to a certain extent not likely to bring on disastrous results, it may serve for sending a number of the lighter ships round the island, where, after silencing the not very formidable fire of the East Battery, they might take up a very convenient station for bombarding the town. 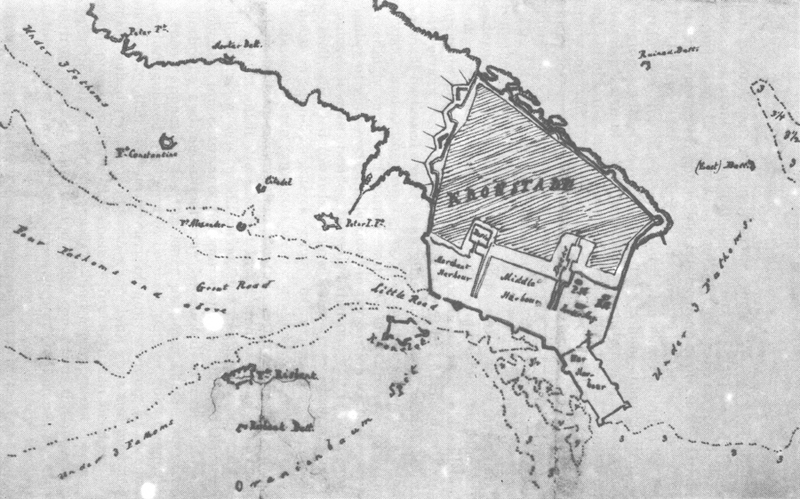 Kronstadt, containing not only the chief naval magazines and dock-yards of Russia in the Baltic, but also plenty of timber in private hands, is full of combustible materials, and a few lucky hits with shell-guns might create a conflagration destroying in one night the naval stores amassed during years. Whether the taking up of such a position by a sufficient number of light men-of-war is actually possible, a close survey of the state of matters on the spot, combined with renewed soundings, must show; whether it is advisable, will depend upon the balance of forces; here we can only state what may, even at a distance, appear feasible from a comparison of the best evidence that can be collected. The main line of attack, then, remains the South Channel, leading to the Great and Little Roads, otherwise called the Narrows. Here the four-fathom channel, several miles wide off the north-western point of the island, suddenly contracts to about a mile in width at two miles distance from the inner harbour, and thence forms an extremely acute angle, the apex of which is situated in front of the man-of-war harbour. Here a narrow bar, passing from the great sand-bank of Oranienbaum to the island, cuts the channel off and reduces its extreme depth to 31/2 fathoms. The Russians have taken good care to preserve this natural fortification for their man-of-war harbour, although a little dredging would remove it. This four-fathom channel, then, the central passage of which is nowhere less than 41/2 fathoms deep, and admits the largest men-of-war, is the line of approach to Kronstadt, and the decisive struggle must take place in its apex, which, for a mile and a half, is nowhere more than 400 yards wide. The fortifications which defend this channel are of all sorts, from the antediluvian buildings of Peter the Great, to the most modern and formidable constructions with two or three tiers of guns one above the other. It is remarkable that the most important points are defended by fortifications of old and faulty construction: this is the weak side of Kronstadt. The old fortifications are small bastioned works, with guns firing from behind an open parapet, and with few or no casemated guns at all; with exceedingly small and narrow bastions, and therefore carrying a number of guns exceedingly small in proportion to their extent of frontage. It must, besides, be stated that one half of their guns is generally directed towards shallow water from which at the very utmost a gun-boat attack could be expected. But to such fortifications even gun-boats were formidable. The modern constructions, on the contrary, are planned upon the system which Montalembert first introduced and which since, with more or less modification, has been generally adopted, especially for coast and harbour defences. Besides Kronstadt, Cherbourg and Sevastopol may be quoted as examples of its extensive application for this latter purpose. These constructions are distinguished by their two or three tiers of guns ranging one above the other, the lower tiers of guns standing in casemates, small vaulted rooms, as it were, where both guns and men are as much protected from the enemy's fire as it can be done. The upper tier of guns alone stands behind a parapet not covered in, but from their elevated station which commands the upper decks of the largest three-deckers, are well protected against the effects of shot. The trial of an attack will show, whether these forts have actually been constructed solidly enough to bear the concussion of their own and the effect of the enemy's fire; but if they are, they will prove the hardest nuts to crack. We may distinguish three lines of fortifications around the Kronstadt channel. The first, or outer, line embraces in a semi-circle the mouth of the Great Road, or that part of the four-fathom channel which is from one mile to half a mile in width. The right, or northern, wing of the position is formed by the Peter Fort, an insignificant lunette on the island, about 1,400 yards from the deep water channel; a mortar battery, also on the island, half a mile to the east, which may be considered as almost useless, and the Fort Constantine, a strong lunette closed to the rear, built on the sands, within 1,000 yards from the edge of deep water, exactly in front of the mortar battery. This fort is of modern construction and carries 50 guns in two tiers. It serves to defend the outer approaches, and may become troublesome to a 'fleet while forming; but if once passed, one half of its guns become useless. The centre of the first line is made up by Fort Alexander (not the one on the north end of the island, mentioned before); a semi-circular building erected in three fathoms water within four hundred yards of the deep channel where it narrows to half a mile. This fort therefore sweeps the channel from side to side, and small as it looks on plans and charts, it carries no less than seventy two guns in three tiers. If it be of sufficiently solid construction, and with well-ventilated casemates so as to draw off the smoke, this tower-like fort will give enough to do to a couple of three-deckers. Behind it lies the old Citadel, a lunette the insignificance of which is proved by the very existence of the new fort, which intercepts the fire of one half of its guns. The left or southern wing, finally, is formed by the Risbank Fort and Battery, situated south of the entrance to the Great Road. This fort, constructed in the last century, has undergone a modernizing process, in consequence of which part of its guns are disposed in two tiers and their total number is increased to fifty. But for all that it occupies a far larger area than the modern forts, offering a frontage towards the roads of some 300 yards, which frontage, besides, is enfiladed, partially from the deep water channel, and entirely by a position which vessels of lighter draft may take up in 31/2 to 3 fathoms water within half a mile westwards. To obviate this, the Risbank Battery has been built 600 yards to the rear, but in a position little adapted for that purpose. The Risbank Fort lies exactly a mile south from Fort Alexander, and both sweep the entrance to the Great Road with cross fire. This first line of defences would not in itself prove very formidable, if it were not materially supported by the more distant fire of the second line. The second line protects the whole of the Great Road along with the entrance to the Little Road. It consists of the two flanking works of Fort Peter the First (old, badly constructed, a sort of crown-work situated half a mile east of Fort Alexander, and carrying on a frontage of 250 yards only 24 guns), Kronslot (bastioned old-fashioned work of five fronts, two of which look towards the shallow water and are therefore useless, carrying, although 400 yards in its longest diagonal, no more than 36 guns) and lastly, the fortified western wall of the Merchant Harbour in the centre. This wall, projecting from the island of Kronstadt itself, comes down to the very edge of the deep channel with which it forms a right angle, and which is here but 300 yards wide. It carries 70 guns and 12 mortars, part of which however appear so placed as to have little effect upon the shipping, and offers, in conjunction with both the main fronts of Peter I Fort and two fronts of Kronslot, a most effective cross fire over the inner half of the Great Road, where because of the obstacles created by the fire of the first line, and the narrowness of the channel, it must be extremely difficult for any ships but screw-steamers to take up a good position in sufficient force. The third line, the direct defence of the Little or Inner Road, is formed, on the south side of the channel, by a third (the North East) front of Kronslot, and on the north and east side by the fortified walls of the Merchant, Middle, and Man-of-war harbours. The latter, projecting at an obtuse angle at the eastern end of the Middle Harbour, rakes the whole of the Little Road, while the south wall of the Merchant and Middle harbours protects it by a front fire. Both walls are flanked by several bastions, fortified gates and other projections. The width of the deep water channel, here, being nowhere greater than 250 yards, the fighting would be very murderous, but it is hardly to be doubted that before ships could penetrate so far, Kronstadt would have to capitulate. The central work of this third line, and the only one which may ever have any practical utility, is Fort Menchikoff, the first bastion, from the west, on the Merchant Harbour south wall. This bastion has been reconstructed into a tower of imposing proportions, carrying 44 guns in four tiers above one another one half of which enfilade the greater part of the Little and Great roads, the other half appearing, from the direction of their embrasures, almost useless. Whether the four tiers of guns will not prove too heavy for the narrow foundation of the building, remains to be seen. We may add that on the land-side Kronstadt is fortified by regularly bastioned fronts, requiring a siege in due form to be forced; and such a siege in the swampy ground of the little island, with only a fleet for base of operations, offers very great difficulties. If Kronstadt is to be taken, it must be done from the sea. It is understood that we could only describe the permanent fortifications such as they existed according to the latest surveys and military reports. There may have been some alterations during_ the last few years, but it is not probable that they have been very important. To recapitulate. The fate of any attack against Kronstadt must be decided in the Great Road, and here the only fortifications that can effectually play against the attacking fleet, are Forts Alexander, Peter I, Risbank, two fronts of Kronslot, the western Harbour Wall, and Fort Menchikoff. Altogether they may bring 350 guns at once to bear upon the attack, most of them well protected by walls and vaults, and firing through narrow embrasures. The other batteries are either directed towards other points of attack, or they are insignificant, or they are not within effective range. The question is: Can a sufficient naval force be brought up this narrow and intricate channel, to face both the northern and southern fronts of defence and to silence their fire, while that force is itself exposed to a raking fire from the Harbour Wall, Fort Menchikoff and Kronslot? Naval men may answer that question, unless they prefer to wait till the actual trial has been made. From what little we have had occasion to learn of naval tactics, we should say that here, if anywhere, is the point where the superiority of screw-ships of the line can produce results which to sailing-ships and paddle-steamers would appear equally unattainable. The great weakness of Kronstadt, we repeat it, are the forts of old construction. They occupy the best positions and the largest portion of available space with the least possible effect of fire. If Risbank has been improved, Peter I and Kronslot remain inefficient. They might be silenced with comparative ease, perhaps even occupied, and in that case might be used to bombard the town. But from the moment ships have penetrated as far as between Alexander and Risbank, they have the town within shell-range, and can do immense mischief, unless sufficiently occupied by the forts. Published in English for the first time in MECW. [b] 1 fathom =6 feet= 1.82 metres.—Ed. The manuscript "The Fortress of Kronstadt" is one of Engels' military articles intended for the London Daily News (see Note 95↓), but it was not published in his lifetime. Sometimes the figures which Engels gives for the artillery in Kronstadt differ from those of the Russian command. This is explained by the lack of information to which Engels himself pointed. With the outbreak of the Crimean war Engels offered his services as military commentator to the liberal London Daily News and sent to the editors his article "The Fortress of Kronstadt" (see Note 84↑) on March 30, and after April 3, 1854, on the request of the editors, the article "The Russian Army" which was to open a series of articles on the Russian land and naval forces. The article was set and Engels probably received the proofs on April 12, 1854 together with a letter by the editor H. J. Lincoln, who asked Engels about his terms. Engels pinned great hopes on this collaboration, believing that permanent work on the newspaper would enable him to give up his commercial activity and move to London. However, as can be judged from Engels' letter to Marx of April 20, 1854, Lincoln cancelled the previous contract when he found out about Engels' political views. Some of the propositions formulated in the article "The Russian Army" were elaborated in "The Military Power of Russia" (this volume, pp. 498-504) and "The Armies in Europe" (present edition, Vol. 14) published in the New-York Daily Tribune and Putnam's Monthly.